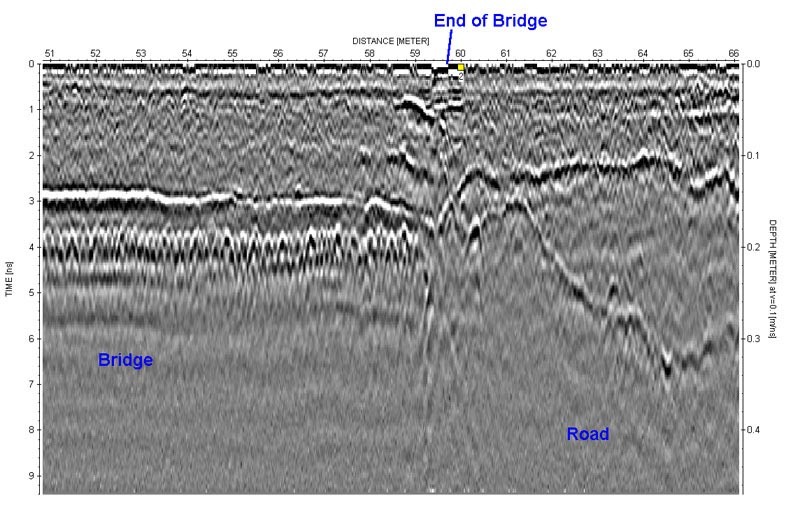 One of the most common uses of GPR is to check on the composition of roads as part of routine maintenance and also to identify the source of known or recurring problems. It is very useful to deploy a multi-channel radar with a range of frequencies. We recommend Groundvue 3_8, our new 8 channel system which operates at data collection speeds fully compatible with driving at traffic speed with all channels plus GPS in full operation, something no other company can offer! Another advantage is that you can mix or match any frequency combination you wish to use with this radar. There are lots of other advantages such as being able to change channel monitoring during the survey or even changing the compensating gain without having to break off surveying. See the product details here. 400MHz antennas will give you the full depth capability and either 1GHz or 1.5GHz will give you near surface definition. 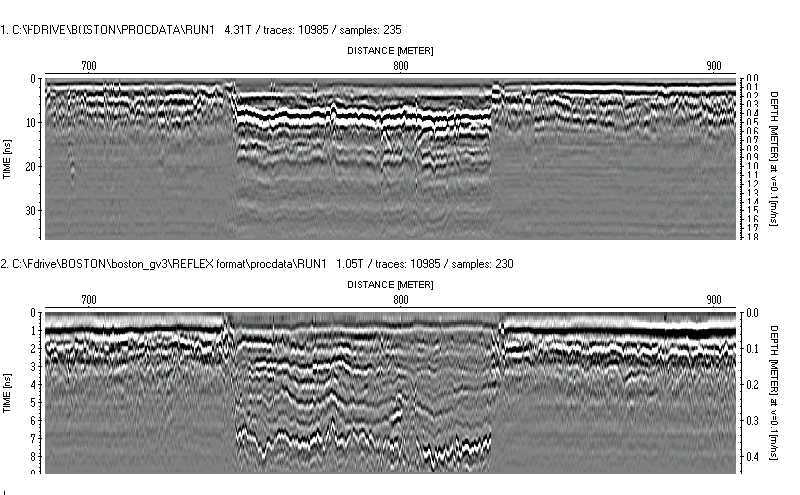 The image below illustrates the difference in depth penetration and definition of the road composition from a 400MHz antenna and a 1.5GHz antennas used simultaneously in a multi-channel system on a road. This also shows the lack of cross channel interference even though the antennas are simultaneously triggered, something else no other company can offer. It is the simultaneous triggering of the antennas which allows this system to travel at traffic speed and still collect data on all 8 channels while also using GPS. It is very much faster than any other multi-channel on offer. Another option is the 4GHz antenna, based on our Groundvue 5 but also part of the multi-channel system, which can detect near surface delamination in greater detail and much earlier than antennas of 2 to 3 GHz. Currently no other company can offer you this level of detailed definition. Since the antennas are simultaneously triggered and because it is possible to use multiple receivers with this system, we can also offer Automatic Velocity Calibration. Using 1 transmitter and 3 receivers of the same frequency placed at known intervals, the operator traces the output from the 3 channels and uses analytical software to compare all three. This gives a continuous output of transmission velocity which can be used to calibrate the data from ns time to cm depth. It is also a very useful way of highlighting the anomalous areas in the road which may require attention. See Specialist Tools for more information. Unlike most multi-channels, this is not a “fixed wing” system. You can use the antennas in any configuration that suits your survey. As with the 4 channel Groundvue 3, you can make the system trolley based, or hand tow or mount it on a vehicle. The distances between the channels can be adjusted according to whatever suits your survey. Flexible? Oh, yes!